You can see all the nominees and the winners here. For purposes of transparency, I'm going to list my nominees in this blog post, followed by the winner and who I voted for, as well as a few stray comments here and there. So, none of the films I nominated made the top five; I ended up voting for If Beale Street Could Talk despite the fact that it's a deeply mediocre film because I was hoping to defeat a far-more-mediocre film, Green Book. If I had known Roma was the favorite of the group, I'd have gone with it in my effort to defeat Green Book. I'm actually pretty happy with Roma winning: it's a movie of magnificent, marvelous skill that leaves me feeling a bit cold despite its deeply human subject matter. It may still end up making my top ten; none of the other nominees will. I voted for Cuaron, since none of my picks made the final cut. 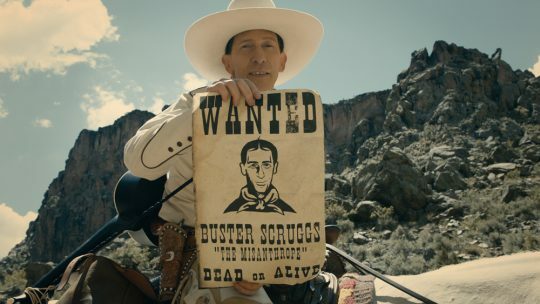 The failure of The Ballad of Buster Scruggs to receive a nomination in any category is a grave black mark on WAFCA's reputation. Also, I nominated Orson Welles because I'll probably never get to nominate Orson Welles in a category ever again, so why not? I voted for Cooper. Apparently Cage just missed the cut, coming in at sixth in the list of nominees. Too bad. I voted for McCarthy. Lady Gaga winning for A Star Is Born is by far the worst choice the group made this year. She was great during the performance scenes and deeply mediocre during everything else. Cooper blew her off the screen. The Death of Stalin, Armando Iannucci, David Schneider, and Ian Martin.